The lucky bamboo plants that commonly are sold at both garden centers and convenience stores are not bamboo plants at all. A member of the Dracaena genus, the lucky bamboo is more related to the corn plant and is simply the stalk of the plant grown in water. Once planted in soil, lucky bamboo is referred to by its common name, the ribbon plant. An easy to care for plant, lucky bamboo is a good starter plant for those who do not feel they have a green thumb. Choose a wide-bowl water vase larger than the existing vase. Center the lucky bamboo plant in the bottom of the vase. Ensure that the roots are spread evenly over the bottom. 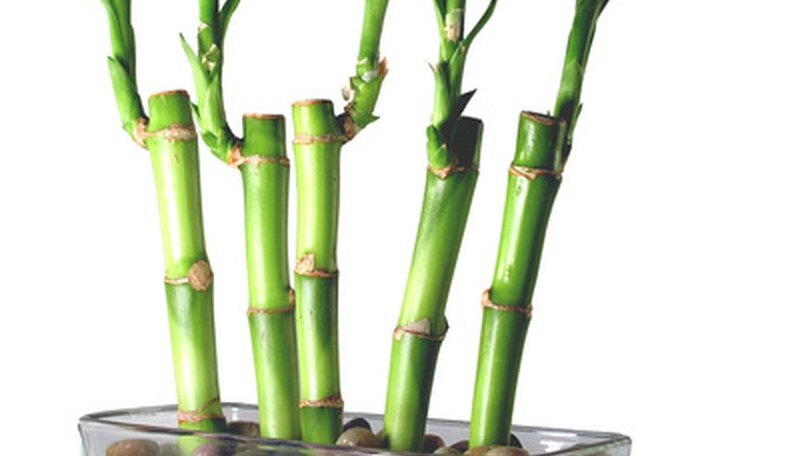 Add pebbles, river rock or marbles to hold the lucky bamboo stalk upright in the vase. Change the water frequently in the vase. This will protect the roots from rot and disease. Choose a planting container several inches larger than the root ball of the lucky bamboo plant. Fill the container with 1 inch of pea gravel and 2/3 of the remainder of the container with potting soil. Water the soil until water drains from the bottom of the pot. Place the lucky bamboo roots on the moist soil. Spread the root out evenly in the pot. Cover the roots and fill the remainder of the pot with potting soil. Place the container in a window where it will receive indirect eastern or western light. Water as necessary to keep the soil moist to the touch. The lucky bamboo is considered an exotic plant and will die quickly if left outside during winter months. Lucky bamboo is a very easy plant to take care of as it grows well in indirect or direct lighting. This makes the plant a favorite for office desks and other locations that have artificial light.